I was sent these products in return for my honest review and opinion. 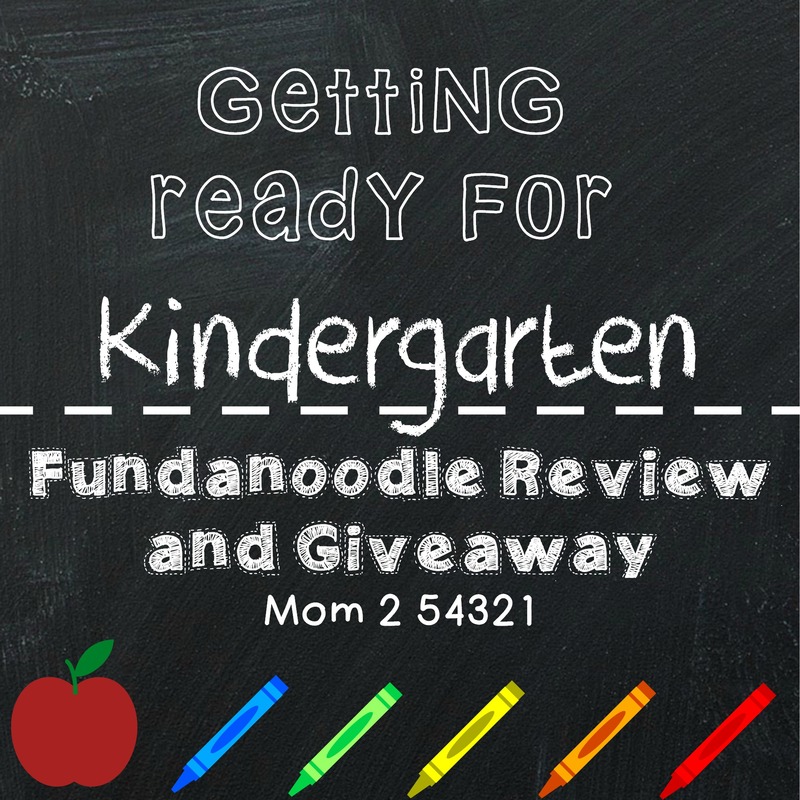 I am so happy to introduce you all to Fundanoodle, a new company that is changing the way we prepare our children for educational success! Fundanoodle’s products range from writing tablets to multi-activity kits, all designed to make learning a fun and interactive experience. 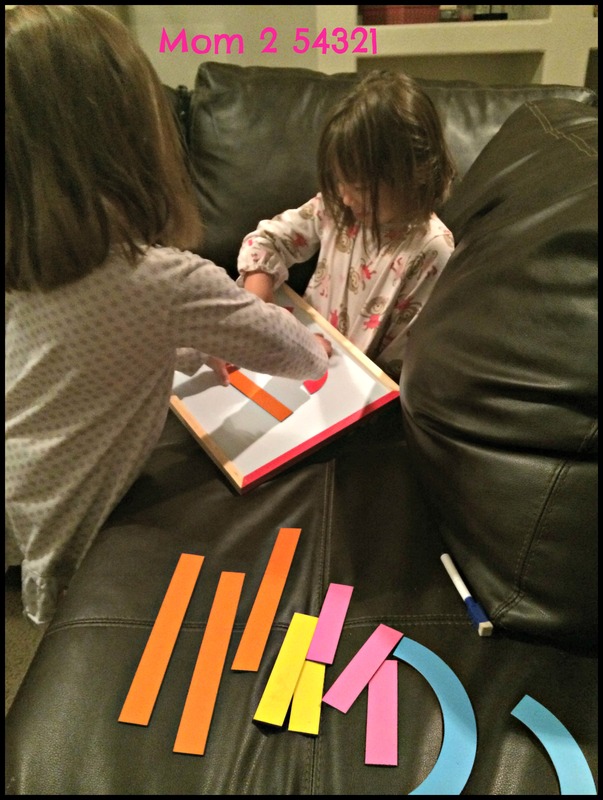 Kids will have so much fun they won’t realize how much they’re learning! 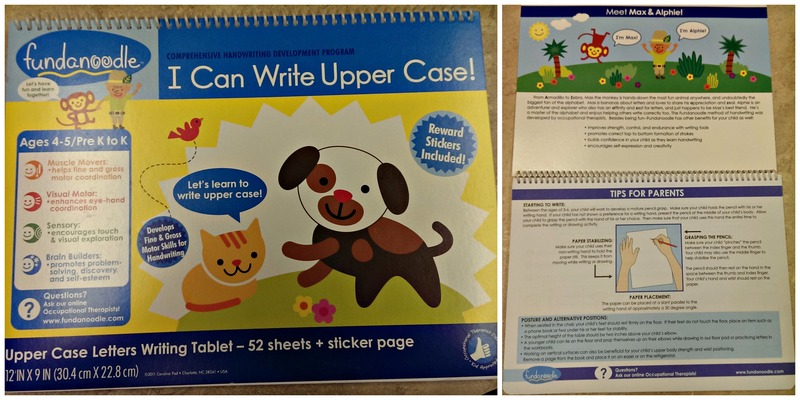 Fundanoodle products range from $8.99 to $32.99. My favorite perk-they offer FREE ground shipping on all orders-I love free shipping! 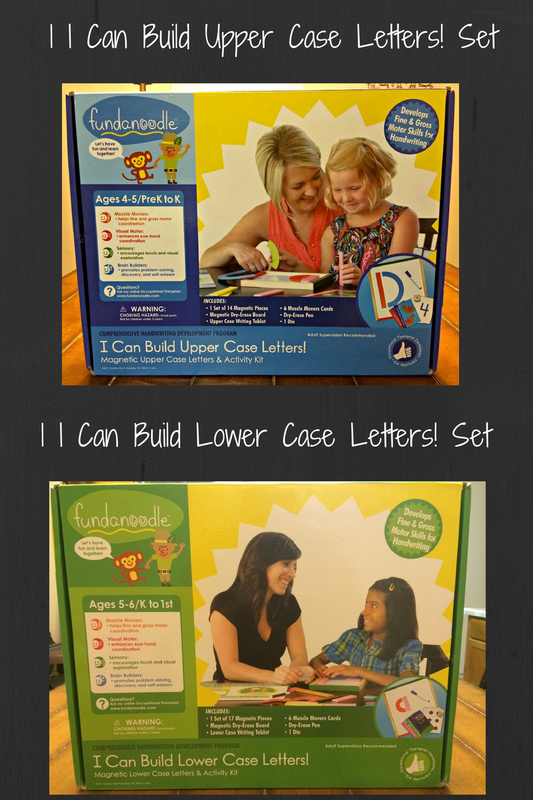 I had the pleasure of reviewing the I Can Build Upper Case Letters Kit and I Can Build Lower Case Letters Kit with the girls. 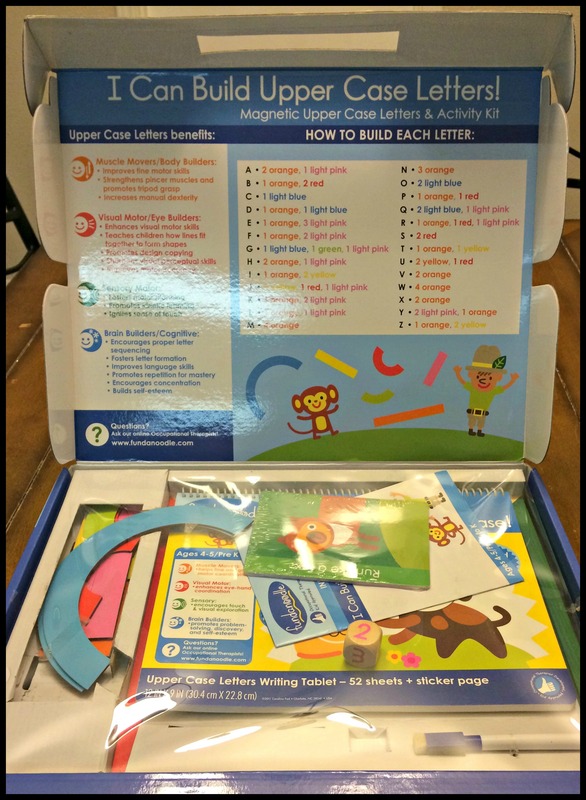 These kits really come with everything you need to help your child learn the letters, but the best part is they won’t only be learning their letters, but other important skills as well I will highlight below. This is what your kit will look like when you open it up-it’s like Christmas so many fun bright things to do the girls and I were so excited to get into it and play. It comes with a magnetic dry erase board, 14 magnetic sticks, one dry erase marker, one writing tablet, and one set of gross motor cards. These are the gross motor cards you get in your kit. 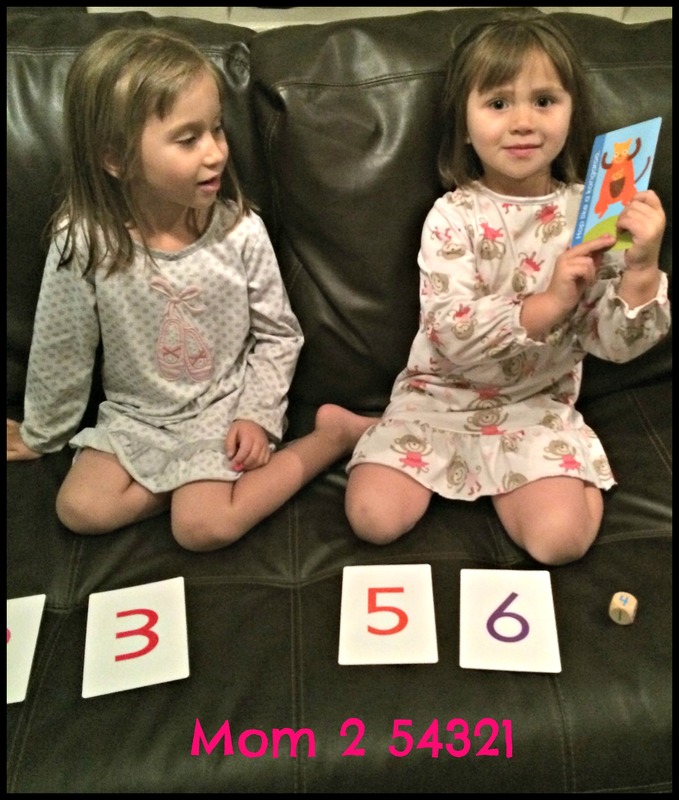 You lay them out with the numbers facing up, the child rolls the dice, and then they pick up the card that has the same number they rolled. The card has an animal and movement that they must now mimic. 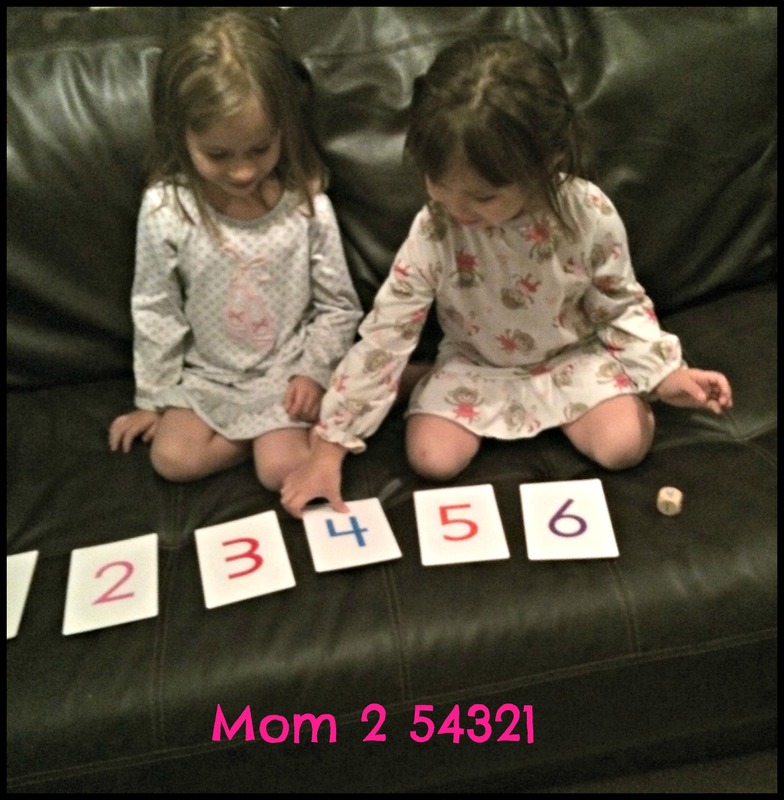 They really loved this activity and I did too because they practiced taking turns, fine motor skills when picking up the dice and then rolling it, and they also practiced counting and number recognition. They even practiced gross motor skills and did some heavy muscle work that really helps them be able to calm down and focus later on while learning. She rolled#4 then we counted the cards until we got to #4. She flipped the #4 card over and got the Kangaroo, and then they are hopped around the living room like Kangaroos! The next activity we did was letter building Sadie could not wait to build letters while Cay, younger, could not wait to just get her hands on the magnets and build pictures. They are 14 months apart and really at different stages. 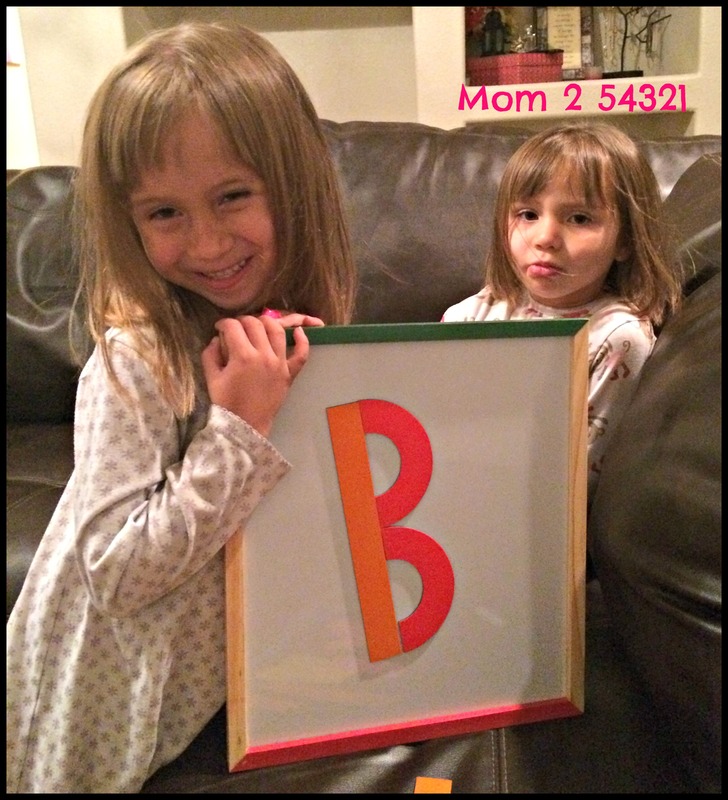 Sadie was able to really build almost every letter from memory. 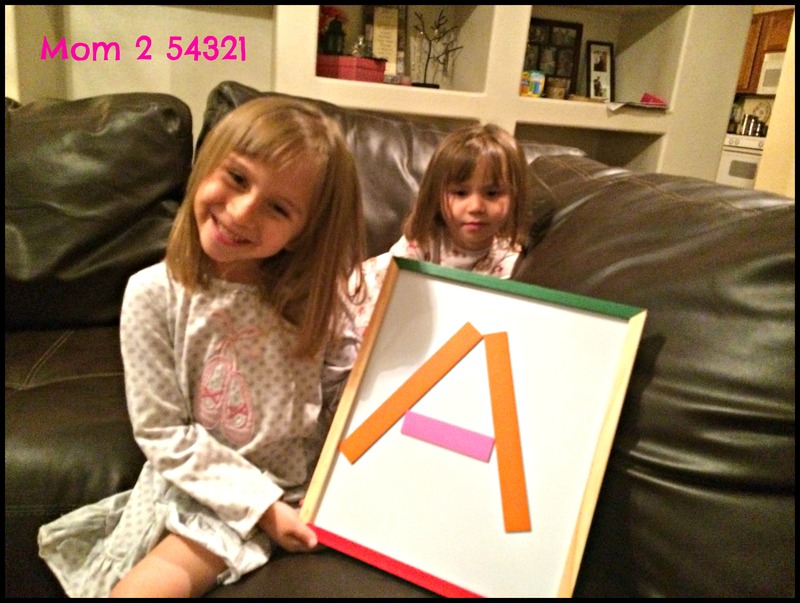 Caydence was able to copy Sadie’s letters and then we would take turns thinking of a word that started with that letter. They began working together to build the letters. I would tell Caydence which color pieces she needed and how many, then Cay would hand them to Sadie who would build them. We did a little more than half of the letters then their attention span was burnt out and that’s okay I let them each make the first letter in their names, then their favorite shapes, then free play. They really enjoyed it. During this activity they practiced fine motor skills picking up and placing the magnets, memory recall, letter recognition and naming, naming colors, counting, and practiced beginning sounds. This is hands down the best writing table I have ever seen and used. The first page talks about Max, Alphie, and goal of the tablet plus gives essential tips for successful writing. 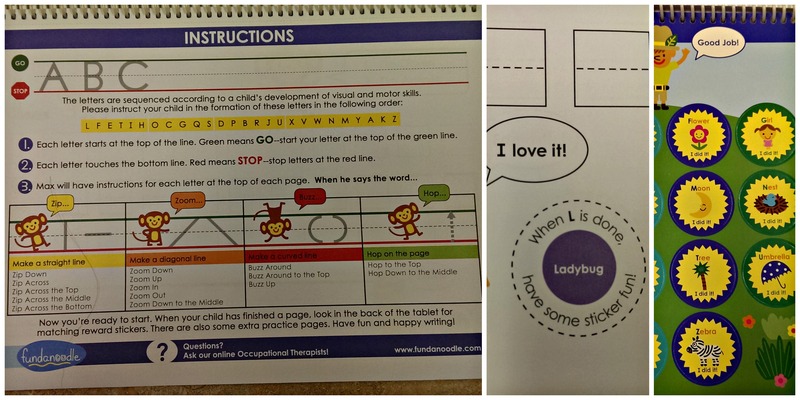 The instruction page talks about the letter sequence which they selected based on the child’s development of visual and motor skills. 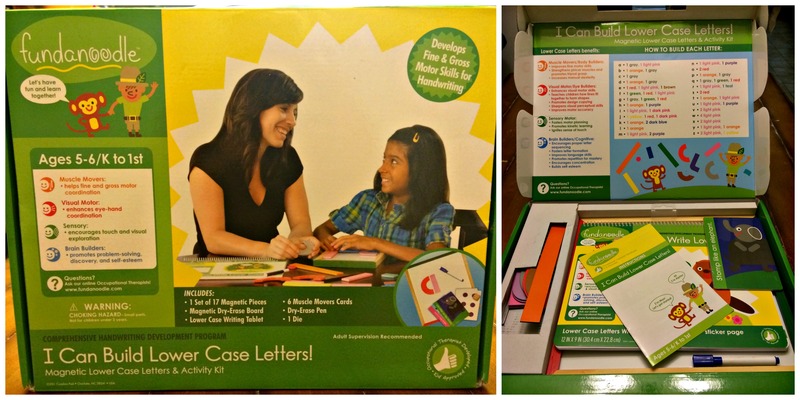 It also gives key words to use when describing to your child how to write each letter. These key words are used in the instructions, given by Max on each page, on how to write the letters. Plus each page has a spot to place a sticker once completed which is a great motivator for my girls! I would like to talk about the durability of this product, because I feel this company really took the time to create a product that is truly designed for use by children. The magnets are very sturdy and durable. The board is well built and strong. The cards are also coated with a glossy finish which add another layer of durability. The I Can Build Lower Case Letter Kit Sadie is ready for, but I think it would confuse Caydence right now. This is what your kit will look like when you open it up. It comes with a magnetic dry erase board, 17 magnetic sticks, one dry erase marker, one writing tablet, and one set of gross motor cards. In order to keep this post shorter I will just focus on the first kit but the second is just as wonderful just focuses on lowercase letter. 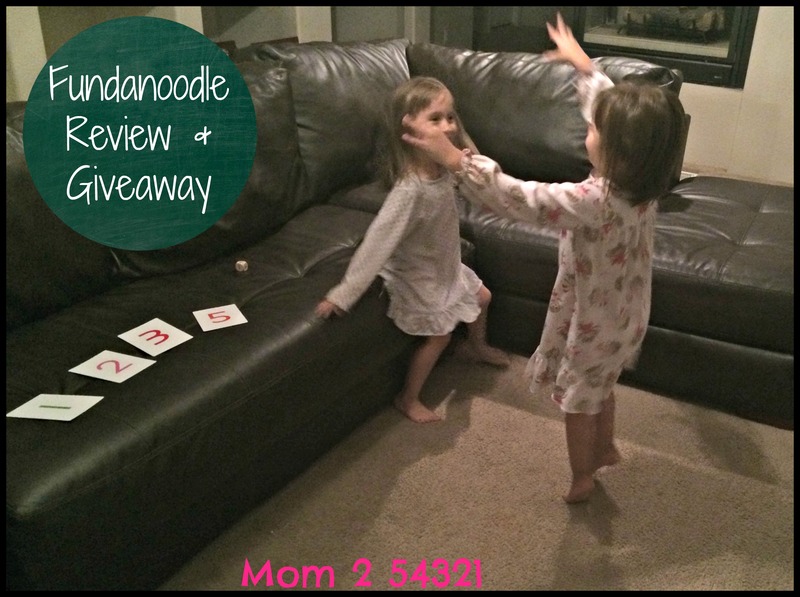 Thanks to Fundanoodle you all have the opportunity to win these kits for the children in your life! Disclosure- Mom254321 was not compensated for this post. All opinions and experiences are my own. Open to the US, must be 18+. Confirmed Winner(s) will be contacted by email and have 24 hours to respond before a new winner will be drawn. No purchase necessary. Void where prohibited by law. Entrants must only enter with either one email address, IP address and/or Facebook account, anyone found violating these rules will be disqualified. It is at the sole discretion of the admin of the giveaway if the winner has met the rules or not. The sponsor(s) will be responsible for product shipment to winner(s) of the giveaway. Sponsor will be responsible for prize fulfillment. This event is in no way associated with, sponsored, administered, or endorsed by Facebook, Twitter, Google, Pinterest or any other social media network. The disclosure is done in accordance with the Federal Trade Commission 10 CFR, Part 255 Guides Concerning the use of Endorsements and Testimonials in Advertising. 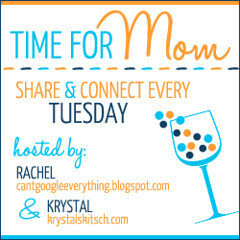 For questions about this giveaway or to have me promote your product, Please email Mom254321@yahoo.com. Visit them online at www.fundanoodle.com! I like their product: I Can Bead, Lace, Rip, Trace. I like the I can do fun activities! Great company! Love this kit. It would be perfect for my son. They also have a I Can Write My Own Stories kit that he’s like. Aren’t those story kits awesome! That is next on our list! Oh I love this!!! I’ve been working hard on a sort of homeschool with my kids before they start with public school and this would be so beneficial!!! I agree this would be a great for you!